Our 23-day itinerary begins in the frigid and arid desert town of San Pedro de Atacama in Northern Chile (Part I), ventures through the Andean Altiplano and the barren Salar de Uyuni (Part II), and continues on to hectic La Paz (Part III). Crossing the border into Peru, we then visit Lake Titicaca (Part IV) and the archaeological sites of Cuzco (Part V), the Inca Trail, and Machu Picchu (Part VI). After spending a few additional days in Lima (Part VII), we travel northwards to colourful Cartagena in Colombia (Part VIII). This introduction to the eight-part series seeks to answer some general queries about travelling in this region of South America. We hope that this will, in turn, give a broad sense of what to consider when planning your trip. Our eight-part travel itinerary covers mostly the Andean region. Q1. South America is massive. What should I see or do? Should I book ahead? A1. Destinations in the Andean region span from surreal natural landscapes to inconceivable man-made structures. It is impossible to see it all. When planning your own itinerary, identify your priority destinations – for these, we would recommend booking ahead to secure high-quality tour groups and desired itineraries. The Inca Trail, in particular, only allows a limited number of trekkers to enter the trail on a given day; therefore, it is important to book early through the trek provider. Quite often, these tour agencies require a deposit to be paid via bank transfer or Western Union to secure your reservation. Because this involves transferring quite big sums of money to unknown hands, diligent research is imperative. For other destinations, tour agencies can be commonly found at popular starting points, and in some instances it may be cheaper and more flexible to reserve local tours when you arrive. This also prevents any unforeseen cancellations and alterations at the final moment. Nonetheless, the decision to reserve ahead is ultimately yours and will depend on your group’s preferred style of travel. Guatín Canyon in the Atacama Desert, near San Pedro de Atacama. The lack of railings means that you can walk right up to the very edge of the canyon. If you do so, watch your step! Q2. OK, you’ve convinced me to travel to South America. When should I go? A2. November to April is the rainy season in this region. 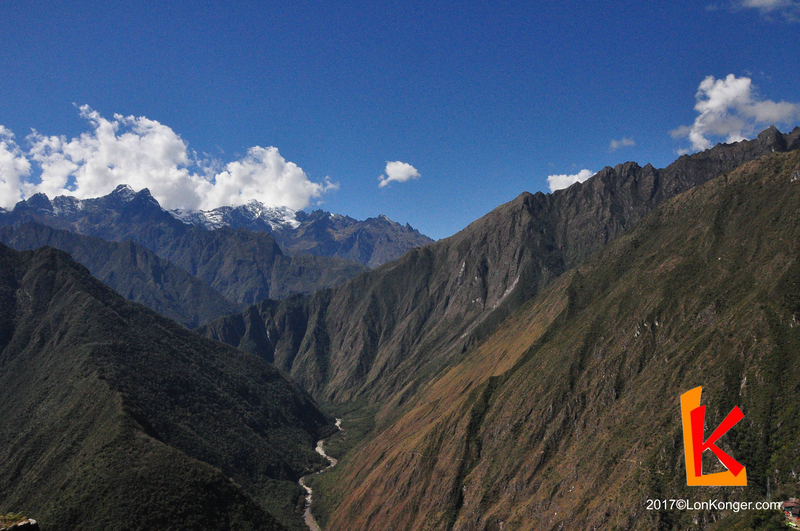 The Inca Trail is closed in February due to potential danger and for maintenance purposes. 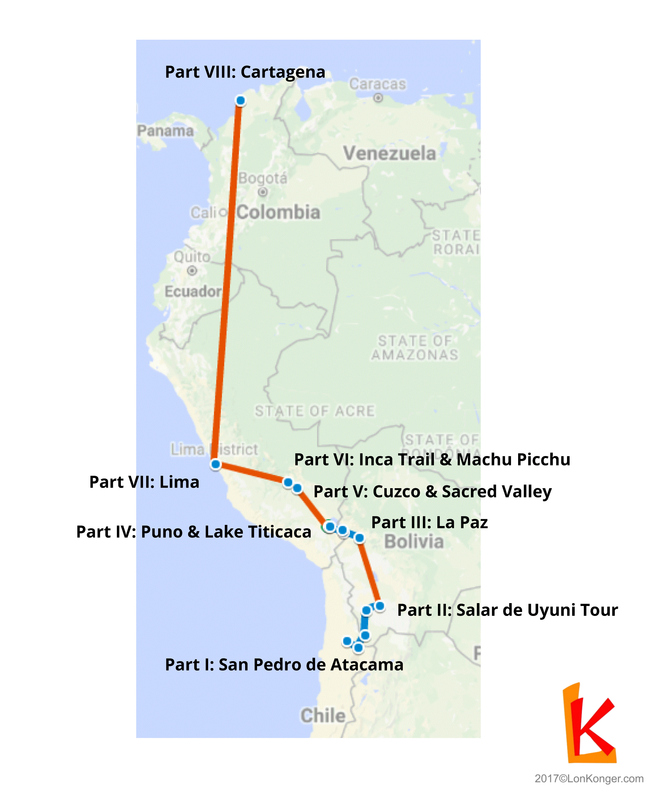 Avoid travelling during this period if you’d like to hike the Inca Trail. On the other hand, the wet season is the best time to see the famous reflection in the Uyuni salt flats, when a few inches of rainfall on the flatness of the vast Salar results in an otherworldly landscape. Temperatures are mild for most of the year, but the further south you travel, the more extreme the temperature range is between summer and winter, and even day and night, especially in the desert regions. It is often safest to pack for a range of weather conditions. Our travels spanned from late June to mid-July during winter in the Southern Hemisphere, but we were mostly blessed with mild weather. Temperatures during our trip ranged from -10oC in the Atacama Desert to 25oC in Colombia. 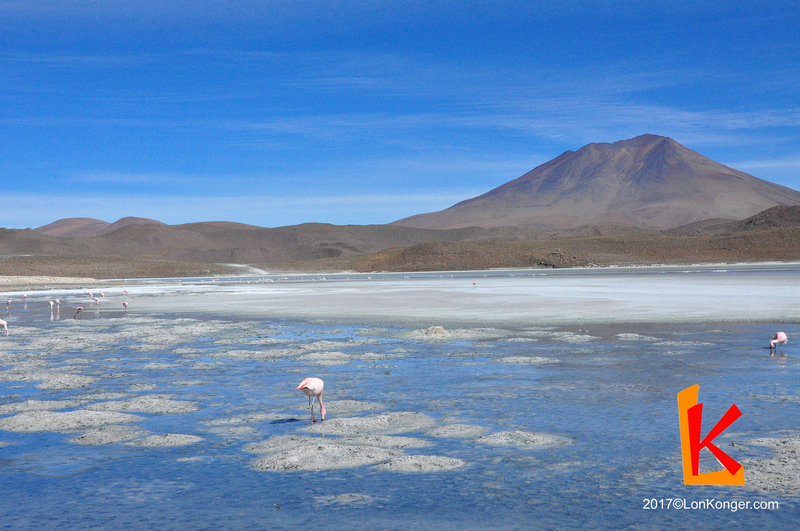 Ignoring the breathtaking view of the Ollagüe Volcano in the Bolivian Altiplano, a James’s Flamingo opts instead to munch on algae, which gives flamingos their distinctive pink colour. Q3. How do I get there? A3. South America is, obviously, best reached by plane. Flights are available via Europe, with numerous flight carriers providing flights from major cities such as London, Madrid and Lisbon, or via North America with American or Latin American flight carriers. Note that you may require a transit visa if you wish to transit via the USA. If you are travelling from Asia, expect a very long journey, via either Europe or the USA. Our starting point, San Pedro de Atacama, requires transit via Santiago, the capital of Chile, which is in turn served by numerous airlines from North America, Europe, and even Australia. Q4. The itinerary spans different cities and countries. How should I travel between the various regions? A4. South America is a large continent, and travelling between countries and cities can be frustratingly slow or expensive. Your main options will be by coach/bus (semicama, cama or cama suite, representing different luxury tiers of long-distance or overnight coaches) or by plane (mainly budget airlines between cities). From our research, travelling by train is not a good option due to its unreliability and relatively slow speed. Flights are more expensive, but are a good option for those with limited time, while buses are the economical option for those who have time to spare. Our group mostly chose to fly between cities (from Uyuni to La Paz, Puno to Cuzco, Cuzco to Lima, and Lima to Cartagena) and only took a long-distance coach once (Bolivia Hop) across the Bolivia-Peru border from La Paz to Puno. 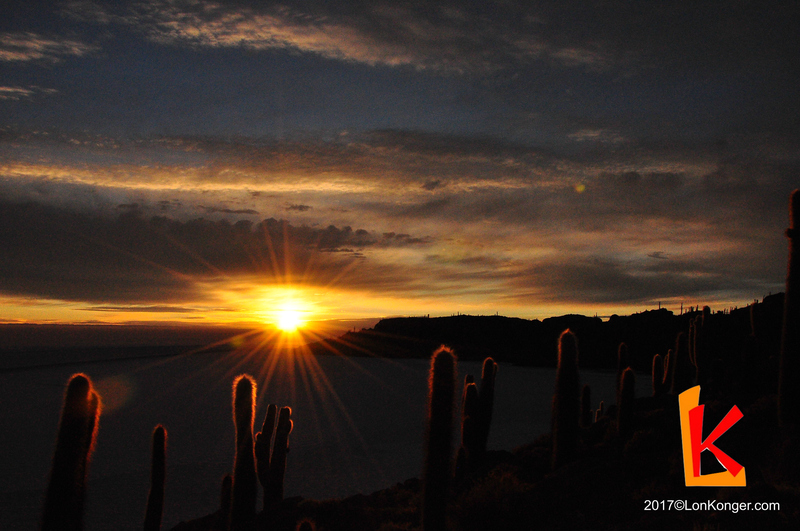 The sun rises over ancient cacti on Incahuasi Island in Salar de Uyuni, Bolivia. The age of this species of cactus can be estimated by its height; it grows approximately 1 cm each year. Q5. Some people say that travelling in South America can be dangerous. Is it safe for me to travel there? A5. A quick Internet search reveals that pickpocketing and theft are not uncommon in South America. While our group did not experience any trouble during our trip, it is imperative to be vigilant and sensible at all times. Keep your personal belongings close to you. Split your cash into multiple locations. Only join reputable tour groups. Do not travel late at night. Avoid drinking excessive amounts of alcohol. Do not draw unnecessary attention to yourself. Buy travel insurance prior to departing – things could go wrong in South America, with delayed travel, stolen items, and accidents being common occurrences. Travel insurance will put your mind at ease should anything go awry. Q6. How about money? What sort of currencies should I bring? A6. Chile, Peru, Bolivia, and Colombia all have distinct currencies, which cannot be easily obtained overseas. To avoid this problem, bring most of your cash in USD and exchange it for the local currency as you travel. Cash is a must (but not strictly required on the Uyuni tour and the Inca trail), with many places not accepting card payments (and even if they did, you may not want to trust your card details on a foreign card machine). Our advice would be to seek out cash exchanges at your port of entry in each country and to avoid ATMs wherever possible, as they have been known to be used to steal card details. On a general note, while travelling to South America and flying between countries are relatively expensive endeavours, food and accommodation are comparatively quite cheap. Once in South America, it is not difficult to travel on a shoestring budget. Q7. Will I require a visa? A7. Hong Kong citizens require a visa to enter Bolivia; if you hold a British passport (including the BNO), no visas are necessary for our itinerary. Obtaining a visa, be it in HK, in the UK, or at the border of the countries themselves, has been a problem for many travellers. Our group members who hold HK passports chose to obtain a visa at the Chile-Bolivia border, which required a 100 USD surcharge, but the process of obtaining a visa was otherwise relatively uneventful. Other requirements for a Bolivian visa include copies of your hotel reservation, copies of the travel ticket out of Bolivia, a copy of the yellow fever vaccination record, copies of your passport and passport photos. You may contact the Bolivian embassy for further information. Sacred Valley near Cuzco. Peru is an archaeologist’s dream, with various significant Incan sites preserved to this day. Q8. I’ve heard that travelling in this region can lead to altitude sickness. What sort of altitudes are reached during the itinerary, and what should I do to prevent it? Proper acclimatisation: Try and include two or three days at intermediate altitudes in order to acclimatise. A slow ascent allows the body to adjust to the increased altitude, and is the best way for proper acclimatisation. Medication: Acetazolamide (Diamox) is commonly prescribed for altitude sickness. Speak to your doctor or pharmacist about the dose and prescription. Acetazolamide can be purchased over the counter in larger cities in South America. Coca leaves: Coca leaves are considered, in particular by locals, to be very effective against altitude sickness. Coca leaves can either be chewed with Stevia or be brewed in tea. Our group spent two days in San Pedro de Atacama (approximately 2400m above sea level) before continuing to higher altitude (reaching a maximum of 5000 m in Bolivia). None of us suffered from severe symptoms of altitude sickness, but many of us felt discomfort at certain points, particularly during physical exertion. Q9. Coca leaves? Isn’t that the raw ingredient for cocaine? A9. Yes – coca leaves contain the psychoactive ingredient found in cocaine and are used for its synthesis. Therefore, coca leaves are internationally controversial and cannot be obtained until within South America (and not at all in Colombia and certain parts of Peru). However, the psychoactive ingredient is present in such low quantities in the natural leaf that you will not feel those effects when chewing coca leaves or drinking coca tea. Stopping its consumption also does not cause any symptoms characteristic of substance addiction. Whether or not you choose to use coca leaves is up to you. One important caveat is that you should never carry coca leaves across borders. Even within South America, different regions may have different rules regarding the possession, sale, or consumption of coca leaves. Q10. Is there anything else I should do to stay in relative good health during my trip? A10. In most countries, tap water is not potable, and it is always wise to buy bottled water or other beverages. It is not uncommon to not be used to the local food and drink during the first few days of your trip. Try to stick to relatively hygienic restaurants. Most of our group was vaccinated against yellow fever, hepatitis, TDP, and tetanus prior to our departure. The yellow fever vaccine needs to be administered at least two weeks before travelling. Retrieve your vaccination records, be sure to get specific travel advice from doctors at travel clinics or your family GP, and arrange vaccinations a sufficient amount of time before the start of your journey. Some of us also took antimalarial tablets prophylactically as we chose to travel to more tropical areas of South America, but this is not strictly necessary for our itinerary. The view of the Urubamba River valley from Phuyupatamarca, the “town over the clouds”. 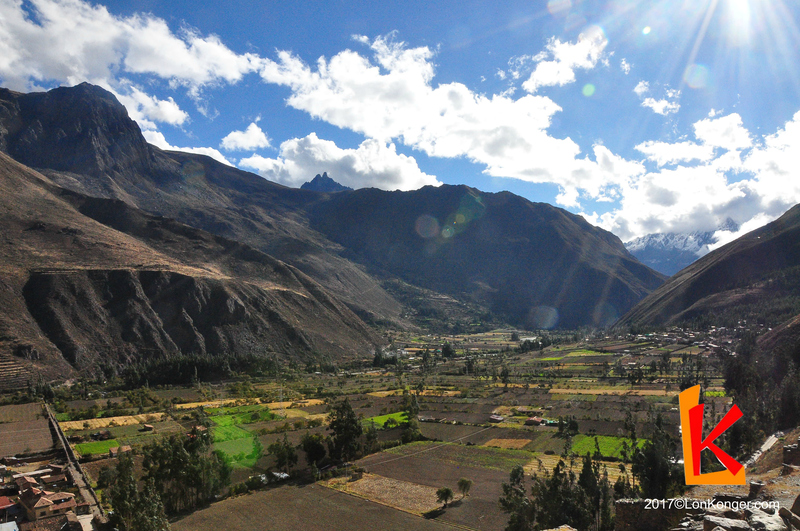 The Urubamba River irrigates the Sacred Valley and was considered sacred by the Incans. Q11. What about food? What should I try? What should I avoid? A11. Be brave about the local cuisine. It’s not often that you find yourself in an exotic location to try the most authentic cuisine on offer. From our experience, South Americans are passionate about their food. From Incan times, when terraces were specifically designed to grow crops, to the modern day, when the debate about the originating country of Pisco and ceviche remains fierce, food is an integral part of their lives. We found the Andean diet to be meat- and carbohydrate-heavy, but vegetarians should have no problem finding vegan-friendly meals. The relatively cheap prices mean that there is often little that would be outside your price range. This is one of the best ways to immerse yourselves in the everyday culture. There aren’t necessarily any must-try dishes, but a rule of thumb may be to eat or drink things you wouldn’t be able to get elsewhere. Q12. Help! I don’t speak any Spanish. Will I be alright? A12. A basic level of Spanish makes a huge difference in the region, especially when it comes to vocabulary relating to numbers, food, and accommodation. While English will allow you to get by in larger cities and while in tour groups, Spanish is almost a necessity when travelling in more rural areas. Knowing a bit of Spanish also allows you to have a more meaningful conversation with some locals! 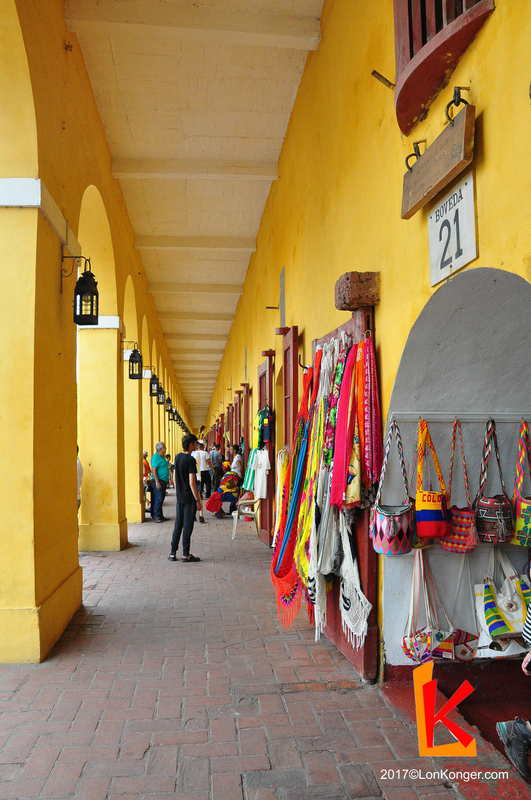 The characteristically yellow Las Bóvedas in the Old City of Cartagena houses 23 shops, each of which sells an array of Colombian souvenirs. 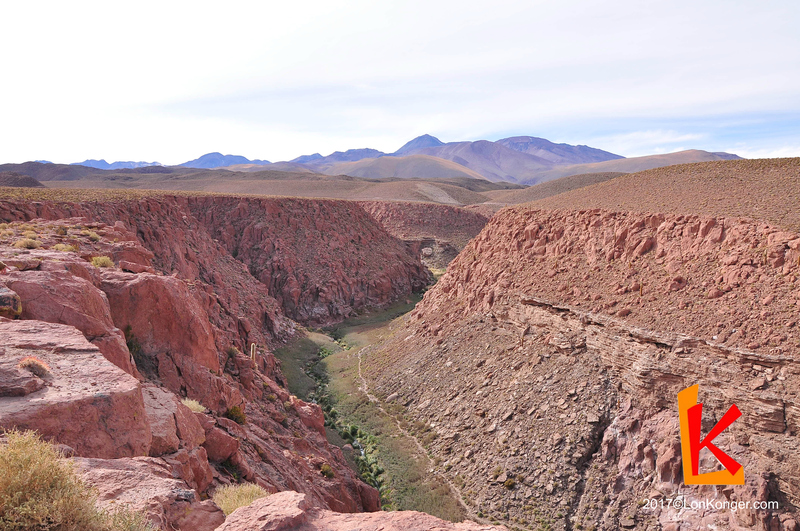 Click here for the first part of our itinerary, in which we begin our trip through the Andes in San Pedro de Atacama and the surrounding attractions in the Atacama Desert. This post is contributed by Terence and edited by LonKonger.